The Secret Weapon Miniatures: Malice RPG: Treasure Chest is an excellent project for new painters, as well as experienced painters who need a few unusual treasure chests and sacks of coins. The set of thirteen miniatures are 28mm and are on the small side. However, this means you can place them on miniature tables or other raised areas more easily than large chests. 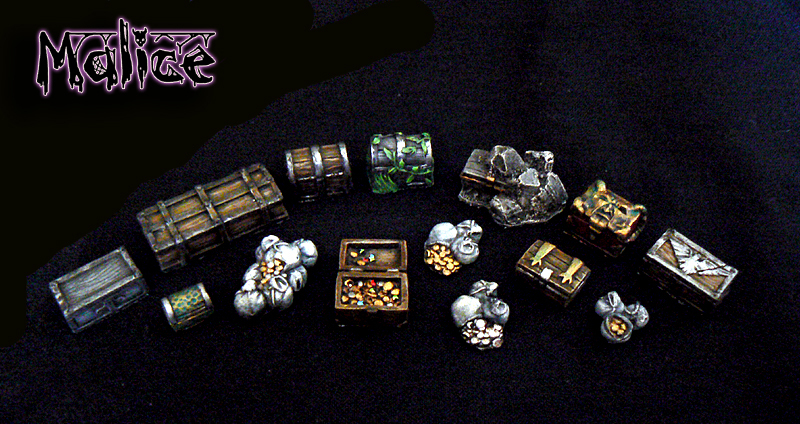 The set consists of thirteen chests and sacks, with a good variety among the treasure chests. The miniatures are cast in resin, allowing them more detail than typical plastic miniatures. As said, these miniatures are very accessible for new painters, and, myself, I assembly-line painted them to advanced tabletop. The set sells for only ten dollars, although they're currently only available on the Secret Weapon Miniatures site. I used the Secret Weapon Miniatures washes Dark Sepia (brown), Hard Body Black (black), and Stone (stone) when painting, and found Blue Black useful as well. I also used Tamiya Clear Red. Dark Sepia and Hard Body Black are also easy to use to blackline the miniatures.